The Great Lakes region contains 20% of Earth’s freshwater, but this enormous ecosystem is threatened by aquatic non-native species. These non-native species have altered every level of the food web and reduced the diversity of native species. Annually, aquatic invasive species impose costs of over 100 million dollars in the Great Lakes region. The New Zealand Mud Snail is the latest invasive species. Initially found in the western United States in the 1980s, the New Zealand Mud Snail has recently invaded Michigan rivers, including the Au Sable River, an internationally renowned trout stream. This presentation will discuss the impacts of aquatic invasive species in the Great Lakes and focus on New Zealand Mud Snails, including current research at Oakland University to better understand the impacts of these invaders. Emily Bovee and Kennedy Phillips are graduate students in the Aquatic Ecology Lab at Oakland University. New Zealand Mudsnails are tiny – about 1/4 inch long! Trying to shake that winter gloom? Come join us for a celebration of last year’s achievements as we warm ourselves with some hearty conversation and great food. Learn about upcoming event and projects while connecting with others involved in our programs. RSVP appreciated to bvanderweide@oaklandtownship.org or 248-651-7810 ext. 401 by Tuesday, January 29. Monarch butterflies are one of the most interesting and recognizable insects in the world. Every year they migrate thousands of miles, from our backyards in Michigan to mountains in central Mexico. They also have fascinating interactions with their toxic milkweed host plants. Unfortunately, monarchs have declined in recent decades and the overwintering population in Mexico is only around 20% of its former size. Nate Haan is a postdoctoral research associate at Michigan State University who does research on monarch butterflies. He will share about their natural history and ecology, as well as some of the current research on their decline and what we can do to save them. If you are interested in volunteering with our prescribed fire crew, join us for this training workshop. We will cover reasons for using prescribed fire, preparations for conducting a fire, necessary tools, roles of each burn crew member, and ignition patterns. Weather permitting, we will do a small demonstration burn after lunch. New crew members are required to attend; past volunteers are encouraged to attend as a refresher. Snacks provided, but please bring your own lunch. RSVP required to bvanderweide@oaklandtownship.org or 248-651-7810 ext. 401 by Thursday, February 21. If you have oak trees on your property, come to the Paint Creek Cider Mill (4480 Orion Rd., Rochester, MI 48306) tonight at 6 pm to learn how to protect them from oak wilt! Oak wilt is an invasive fungus found in Oakland County and throughout Michigan. Red oak trees are the most susceptible, and once infected can die within six to eight weeks. See the attached press release for more information. Don’t miss this chance to learn how to protect your oak trees! We are Oakland Township in Oakland County, after all. Your land can be an oasis for butterflies, birds, and other wildlife! Join us to learn about backyard habitat restoration. We will start at the Paint Creek Cider Mill at 9 am to briefly learn about planning, invasive species control, seed collection, installing plants, and working with contractors. We will then visit a few active ecological restoration sites within the township parks. Don’t miss this chance to enhance your backyard habitat while connecting with other interested landowners! Bombus impatiens on Allium flower. Photo by Caleb Wilson. Phragmites, Knotweed, Swallow-wort, and More: High Priority Invasive Plants! We will walk through the basics of identifying, controlling, and reporting priority invasive species. These invasive plants are known to reduce property values, degrade natural areas, and impair wildlife habitat. Don’t let these plants get established on your property! Come join us for our summer celebration of habitat restoration in Oakland Township! You won’t want to miss the hearty conversation and great food. Learn about natural areas stewardship work in our parks while connecting with others involved in our programs. If there is inclement weather, we will be at the Paint Creek Cider. RSVP appreciated to bvanderweide@oaklandtownship.org or 248-651-7810 ext. 401 by Tuesday, July 17. We’ll celebrate all we’ve done as a community to keep our natural areas healthy. A huge thanks to all of our volunteers! Tuesday, July 24, 2018. 6:30 to 8:30. Meet at the Paint Creek Cider Mill, 4480 Orion Road. Paint Creek Heritage Area-Wet Prairie protects unique examples of the prairie and oak savanna that used to cover over two-thirds of Oakland Township. Purchased in 2003, the Wet Prairie was the first Oakland Township Park to be acquired entirely with the Township’s Land Preservation millage funds. Its 10.46 acres preserve approximately one-quarter mile of scenic vistas and natural habitats along the Paint Creek Trail and it includes the Paint Creek’s former creek bed (before it was redirected by the railroad). The Wet Prairie is a plant lover’s delight – hosting more than 200 species of native plants! The park’s namesake habitat, “wet prairie” was formerly mined of its topsoil and is actually an old sand pit. Its nutrient-poor soils and seasonal high-water table support a unique combination of upland and wetland plants. In addition to the wet prairie, the park also includes a variety of oak-dominated woodlands and wet sedge meadows. When OTPR purchased this property invasive plants and a closed-canopy forest were overtaking these habitats. During the last 15 years, OTPR Land Stewardship staff have restored the prairie area to its grassland glory by removing unwanted woody vegetation and invasive plants and introducing prescribed burning. Whether you visit this site in spring, summer or fall you will be surprised by the variety of flowering plants and prairie grasses! At Draper Twin Lake Park we will check out Twin Lake, then head to the east side of the park. This park was purchased in 2005 with a combination of Land Preservation millage funds and a sizable donation from the Draper family. The name of this 90-acre park honors both this family’s generosity as well as the park’s frontage on the easterly Twin Lake. Draper Twin Lake Park protects wet meadows, a large marsh, shrub wetlands, a kettle wetland, forests and access to Twin Lake. Soon after purchasing this park, OTPR improved its access by constructing a limestone trail, a boardwalk, and a floating dock. These facilities allow our residents to enjoy nature viewing, kayaking, paddle boarding and fishing programs on Twin Lake. A trail system on the east side of the park also provides a popular pedestrian connection between Inwood Road and Parks Road. This trail passes by this park’s 20-acre field which is being restored to prairie by our Land Stewardship staff with the help of a US Fish and Wildlife Service grant. Don’t miss this chance to see bee balm, coreopsis, and other wildflowers blooming in our prairie planting! We will also talk about the role of controlled fire in natural areas management while walking through an area that was burned by our volunteer prescribed burn crew in April 2018. Did you know that there are over 4,000 species of bees in the U.S., at least 450 of which are native to Michigan? Caleb Wilson will explore the fascinating world of wild bee species, debunking common myths and explaining our current understanding of recent, rapid bee population declines. His research focuses on understanding how the local environment at farms and community gardens impacts wild bee communities. Caleb will share how his research into the bees of the metro Detroit area can help us better understand and protect pollinators in our own back yards. Caleb Wilson is a Master’s student in Biology at Oakland. He began his research on urban bees while working toward a BS in Environmental Sciences at the University of Iowa. Caleb is an avid gardener and conservationist, working and volunteering in Japanese gardens, prairie restorations, student farms, and native plant gardens. detention basins, and more. Learn about the aesthetic, ecological, and wildlife benefits realized by slowing down and capturing water in your landscape. Residential rain garden. Photo by Matt Demmon, CNSP. Controlled Fire: Why and How Do We Use Prescribed Burns? Regular prescribed fire benefits many of our forests, meadows, and wetlands. Learn more about reasons for using controlled fire in our natural areas, preparations for controlled fire, and how a controlled fire crew conducts a burn. We will also review the Oakland Township parks scheduled for controlled fire in 2018. If you are interested in volunteering with our prescribed fire crew, join us for this training workshop. We will cover reasons for using prescribed fire, preparations for conducting a fire, necessary tools, roles of each burn crew member, and ignition patterns. Weather permitting, we will do a small demonstration burn after lunch. New crew members are required to attend; past volunteers are encouraged to attend as a refresher. Snacks provided, but please bring your own lunch. RSVP required to bvanderweide@oaklandtownship.org or 248-651-7810 ext. 401 by Thursday, February 22. We’ll savor s’mores and watch “timberdoodles” do their cool aerial mating dance! While we wait for sunset, we’ll enjoy snacks, a spring evening, and some cool facts about woodcock biology. As the light fades we will watch with hushed anticipation for this avian spectacle. Bring a comfortable lawn chair, binoculars, and layers to add as the night cools down. Many native plant seeds are only available for collecting for a few weeks in the fall, so we need as much help as possible during harvest! Seed collecting is a fun, relaxing way to learn new native plant species while experiencing unique natural areas. We use the seed to restore areas where we have removed invasive plants. All workdays are 12:30 – 3:30 pm. Seed Collecting – October 6, 12, 19, & 26. Meet at the Paint Creek Cider Mill, 4480 Orion Road, before heading to our site for the day. Seed Cleaning, December 5: Meet at Watershed Ridge Park, 1720 W. Buell Rd. parking lot along the Paint Creek Trail. All workdays are 9 am to 12 pm. Please remember to wear long pants and closed-toe shoes suitable for uneven terrain. Please dress for the weather and bring gloves if you have them. We provide tools, light snacks, water, and know-how. All minors must have a waiver signed by a guardian, and minors under 14 must be accompanied by a guardian. Regular prescribed fire benefits many of our forests, meadows, and wetlands. Learn more about reasons for using controlled fire in our natural areas, preparations for controlled fire, and how a controlled fire crew conducts a burn. We will also review the Oakland Township parks scheduled for controlled fire in 2017. If you are interested in volunteering with our prescribed fire crew, join us for this training workshop. We will cover reasons for using prescribed fire, preparations for conducting a fire, necessary tools, roles of each burn crew member, and ignition patterns. Weather permitting, we will do a small demonstration burn after lunch. New crew members are required to attend; past volunteers are encouraged to attend as a refresher. Snacks provided, but please bring your own lunch. RSVP required to bvanderweide at oaklandtownship dot org or 248-651-7810 ext. 401 by Thursday, February 23. Max registration is 15 people. $20 for township residents, $35 for non-residents. First two classes are free. Sign up by March 16 for the March, April, May, and June classes. This class will meet monthly to learn about the plants of southeast Michigan, focusing on local examples in Oakland Township. We will learn about the basics of plant anatomy and morphology, winter woody plant identification, identifying common plant families, and natural communities of Michigan. All adults 16+ are welcome, no plant experience necessary. Meet at the Paint Creek Cider Mill one evening per month (two in February), 6:30-8:30 pm. Includes fields trips to locations within a 5 minute drive. Course continues through the summer! Course dates and tentative topics listed below. Protecting Michigan’s Rare Amphibians and Reptiles – including the Massasauga Rattlesnake! From the HRM website: David Mifsud “Turtle Dave” is a certified professional wetland scientist through the International Society of Wetland Scientists and a certified professional ecologist through the Ecological Society of America. He has worked for over fifteen years in wildlife biology, wetland ecology, and habitat conservation and management, with an emphasis on herpetofauna. He is an authority in Michigan on conservation and management of amphibians and reptiles. David administers the Michigan Herpetological Atlas project, sits on the State of Michigan Amphibian and Reptile Technical Advisory board, and chairs the Michigan chapter of Partners in Amphibian and Reptile Conservation (MIPARC). He serves as an expert on Great Lakes turtles for the International Union for Conservation of Nature (IUCN) Tortoise and Freshwater Turtle Specialist Group. He has also served on the board of the North Central Chapter of the Society of Wetland Scientists and currently serves as a co-chair for the Michigan Wetland Association Research and Science Committee. Michigan is home to over 60 species of reptiles and amphibians (called “herpetofauna”). More than half are designated as “Species of Greatest Conservation Need” by the Michigan Department of Natural Resources (MDNR). In 2016 the Eastern Massasauga Rattlesnake was elevated to Federally Threatened by the U.S. Fish and Wildlife Service. This designation has significant impacts on the conservation and management of these snakes in Michigan. This presentation will focus on rare amphibians and reptiles in Michigan, with emphasis on the Massasauga Rattlesnake, and discuss the basic natural history, threats, and conservation needs for these species. Eastern Massasauga Rattlesnake. Photo by Andrew Hoffman, used under Creative Commons license CC BY-NA-ND 4.0. No changes were made to the photo. Thursday, February 9, 6:30 pm at the Paint Creek Cider Mill. Through oak savanna, floodplain forest, and prairie fen, Jesse Lincoln traverses southern Michigan to document the condition of its public lands. These surveys reveal both the natural beauty and imperiled state of our public natural areas. Jesse will share his observations of these treasures, concerns for their future health, and the shared responsibility to care for our natural heritage. Jesse has been conducting ecological surveys on public lands across Southern Michigan for past 7 years as an ecologist for the Michigan Natural Features Inventory. Don’t miss this great opportunity to learn about our natural heritage! Earth Day for the Birds! Join us to eat s’mores and watch woodcock do their cool aerial mating dance! Woodcock begin dancing just after sunset, which is at 8:22 pm on Earth Day 2016. While we wait for sunset we will enjoy snacks, a spring evening, and a brief intro to woodcock biology. As the light fades we will quiet down so that we can enjoy this avian spectacle. Bring a comfortable lawn chair, binoculars, and layers to add as the night cools down. Laurel Zoet, Naturalist, Nature on the GO! As a Naturalist Educator, Laurel has over 10 year of experience, working as a Explorer Guide with the Michigan DNR, interpretive naturalist with Huron-Clinton Metroparks, Naturalist with West Bloomfield Parks and Recreation, and School Program Coordinator with the Leslie Science and Nature Center. Laurel is passionate about connecting people of all ages with the diversity and wonder of the natural phenomenon right in their own backyards. Native Americans told legends about the coyote and yet today this wild canine only seems to see bad press. How can one animal be feared by some and revered by others? Utilizing data collected in recent big city studies, this one hour educational presentation will look at the biology, the myths, and the facts about one of North America’s most highly adaptable animals. Mike Losey, Natural Resources Manager, Springfield Township, MI. Mike grew up in Oakland County, and even spent some time with Oakland Township as a seasonal stewardship technician. Most recently Mike spent 6 years working in the Oak Openings region in northwest Ohio with The Nature Conservancy. He recently returned to the area as the Natural Resources Manager for nearby Springfield Township. The Lakeplain Oak Openings is a unique region spanning seven counties in southeast Michigan and northwest Ohio. With over 150 state or federally listed species, it is well recognized as a biodiversity hotspot within the Lake Erie watershed. However, despite its noted importance the natural habitat is highly fragmented and stressed by incompatible land use. These modifications have negatively impacted the native flora and fauna as well as compromised the ecosystem services the region provides. Attendees will learn about the special features of this region, how it compares and contrasts with the landscape of northern Oakland County, and what efforts are underway to restore this important part of our natural heritage. Public Meeting – 6:30 pm, Thursday, February 25, Paint Creek Cider Mill. Regular prescribed fire benefits many of our forests, meadows, and wetlands. Learn more about reasons for using controlled fire in our natural areas, preparations for controlled fire, and how a controlled fire crew conducts a burn. We will also review the Oakland Township parks scheduled for controlled fire in 2016. Volunteer Crew Training – 9 am to 2 pm on Saturday, February 27, Paint Creek Cider Mill. If you are interested in joining our volunteer prescribed fire crew, join us for this training workshop. We will cover reasons for using prescribed fire, preparations for conducting a fire, necessary tools, roles of each burn crew member, and ignition patterns. Weather permitting we will do a small demonstration burn after lunch. Snacks will be provided, but please bring your own lunch. RSVP required to bvanderweide@oaklandtownship.org or 248-651-7810 ext. 401 by Thursday, February 25. 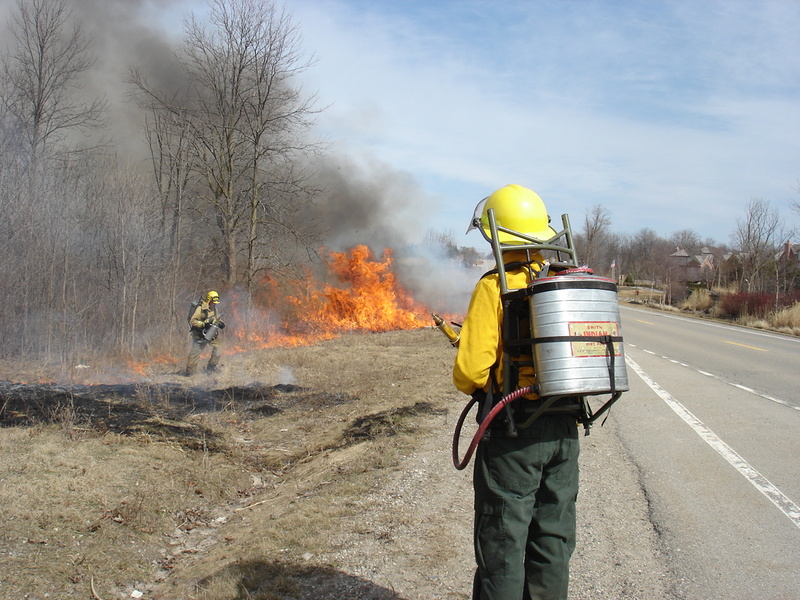 Description: Regular prescribed fire benefits many of our forests, meadows, and wetlands. Learn more about reasons for using controlled fire in our natural areas, preparations for controlled fire, and how a controlled fire crew conducts a burn. We will also review the Oakland Township parks scheduled for controlled fire in 2016. Description: If you are interested in joining our volunteer prescribed fire crew, or would like to learn more about using prescribed fire as a land management tool, join us for this training workshop. We will cover reasons for using prescribed fire, preparations for conducting a fire, necessary tools, roles of each burn crew member, and ignition patterns. Snacks will be provided, but participants should bring their own lunch. Weather permitting we will do a small demonstration burn after lunch. Description: If you are interested in joining our volunteer prescribed fire crew, or would like to learn more about using prescribed fire as a land management tool, join us for this training workshop. We will cover reasons for using prescribed fire, preparations for conducting a fire, necessary tools, roles of each burn crew member, and ignition patterns. Weather permitting we will do a small demonstration burn after lunch. RSVP required to bvanderweide@oaklandtownship.org or 248-651-7810 ext. 401 by Wednesday, December 9. Our prescribed fire contractor burns at Gallagher Creek Park, spring 2015. We will work to remove invasive shrubs like buckthorn and autumn olive in some of our special natural areas. Expect work to be physically demanding. All workdays are 9 am to 12 pm. Paint Creek Heritage Area – Wet Prairie. Prairies are one of the least common and most endangered natural communities in Michigan. Come to one of these workdays to see a spectacular example of prairie right in Oakland Township. Meet at the Silver Bell Road parking lot along the Paint Creek Trail. Workdays for summer and fall 2016 are listed below. Now a rite of spring, get out to enjoy the warm spring breezes while pulling garlic mustard. This invasive biennial degrades even healthy woodlands. Blue Heron Environmental Area – 3320 N. Rochester Rd., 9 am – 12 pm. May 17 and 24. Oakland Township will be treating invasive Phragmites along major roads right-of-ways in August and September 2016. Phragmites (pronounced frag-MY-tees) is a grass that grows primarily in wetlands and can reach heights of 15 feet or more, leading to safety and environmental problems. Phragmites can cause hot, damaging fires if ignited; blocks views at intersections; and impairs drainage in ditches and streams, damaging road infrastructure. This large grass forms dense stands, crowding out habitat for wildlife and native plants. Oakland Township Parks and Recreation is participating in the Oakland County Cooperative Invasive Species Management Area (OC CISMA), which was recently awarded a $243,775 Michigan Invasive Species Grant in 2016. This grant will be used to develop a strategic plan for all of Oakland County; coordinate invasive species control among cities, villages, and townships; and perform on-the-ground treatment of high-priority infestations of six invasive species. Visit http://www.michiganinvasives.org/occisma/ to learn more. Treatment of Phragmites along major township road right-of-ways is funded by our portion of the grant. Please visit the Oakland Township website to view the map showing road right-of-ways where Phragmites will be treated. If you have any questions or concerns please contact Ben VanderWeide, Park and Recreation Natural Areas Stewardship Manager, at 248-651-7810.